Chelsea Clinton: Ladies and gentlemen, my mother, my hero, and our next President, Hillary Clinton. Hillary: Thank you so much. Thank you. Thank you all so much. Thank you. Thank you. Thank you all very, very much. Hillary: Thank you for that amazing welcome. Thank you all for the great convention that we’ve had. And Chelsea, thank you. I am so proud to be your mother and so proud of the woman you’ve become. Thank you for bringing Marc into our family, and Charlotte and Aidan into the world. And Bill, that conversation we started in the Law Library 45 years ago, it is still going strong. Crowd: Hillary! Hillary! Hillary! Hillary! Hillary: That conversation has lasted through good times that filled us with joy and hard times that tested us, and I’ve even gotten a few words in along the way. On Tuesday night, I was so happy to see that my explainer-in-chief is still on the job. I’m also grateful to the rest of my family and to the friends of a lifetime. For all of you whose hard work brought us here tonight, and to those of you who joined this campaign this week, thank you. What a remarkable week it’s been. Hillary: We heard ‘The Man From Hope’, Bill Clinton and the man of hope, Barack Obama. Hillary: America is stronger because of President Obama’s leadership. And I’m better because of his friendship. Hillary: We heard from our terrific Vice President, the one and only Joe Biden. Hillary: He spoke from his big heart about our party’s commitment to working people as only he can do. And First Lady Michelle Obama reminded us, that our children are watching. And the President we elect is going to be their President too. And for those of you out there who are just getting to know Tim Kaine, you will soon understand why the people of Virginia keep promoting him from City Council and Mayor, to Governor and now Senator. And he will make our whole country proud as our Vice President. Hillary: And I want to thank Bernie Sanders. Hillary: Bernie. Bernie, your campaign inspired millions of Americans, particularly the young people who threw their hearts and souls into our primary. You’ve put economic and social justice issues front and center where they belong. And to all of your supporters here and around the country, I want you to know, I’ve heard you. Your cause is our cause. Hillary: Our country needs your ideas, energy and passion. That is the only way we can turn our progressive platform into real change for America. Hillary: We wrote it together. Now let’s go out and make it happen together. 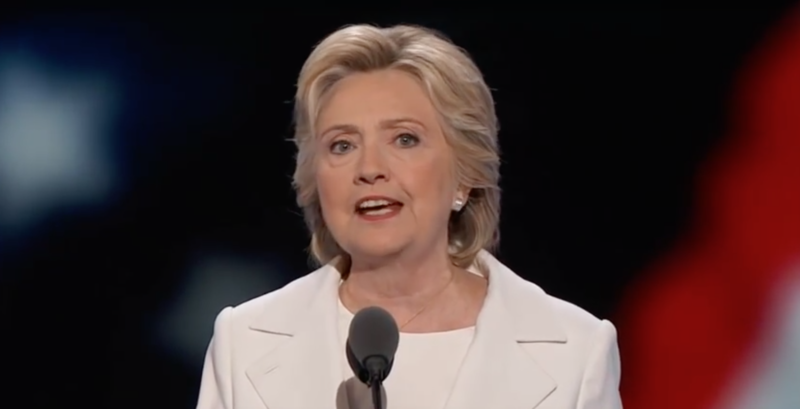 Hillary: My friends, we’ve come to Philadelphia; the birthplace of our nation, because what happened in this city 240 years ago, still has something to teach us today. We all know the story, but we usually focus on how it turned out, and not enough on how close that story came to never being written at all. When representatives from 13 unruly colonies met just down the road from here, some wanted to stick with the king and some wanted to stick it to the king. Hillary: The revolution hung in the balance. Then somehow they began listening to each other, compromising, finding common purpose. And by the time they left Philadelphia they had begun to see themselves as one nation. That’s what made it possible to stand up to a king. That took courage, they had courage. Our founders embraced the enduring truth that we are stronger together. Hillary: Now… Now America is once again at a moment of reckoning. Powerful forces are threatening to pull us apart. Bonds of trust and respect are fraying. And just as with our founders, there are no guarantees. It truly is up to us. We have to decide whether we will all work together, so we can all rise together. Hillary: Our country’s motto is ‘E Pluribus Unum’, ‘Out of many, we are one’. Will we stay true to that motto? Well, we heard Donald Trump’s answer last week at his convention, he wants to divide us from the rest of the world and from each other. He’s betting that the perils of today’s world will blind us to its unlimited promise. He’s taken the Republican Party a long way, from morning in America to midnight in America. Hillary: Now. We are clear eyed, about what our country is up against. But we are not afraid. We will rise to the challenge just as we always have. We will not build a wall. Instead we will build an economy where everyone who wants a good job can get one. Hillary: And we’ll build a path to citizenship for millions of immigrants who are already contributing to our economy. Hillary: We will not ban a religion. We will work with all Americans and our allies, to fight and defeat terrorism. Yet we know there is a lot to do. Too many people haven’t had a pay raise since the crash. There’s too much inequality, too little social mobility, too much paralysis in Washington. Too many threats at home and abroad. But just look for a minute at the strengths we bring as Americans to meet these challenges. We have the most dynamic and diverse people in the world. We have the most tolerant and generous young people we’ve ever had. Hillary: We have the most powerful military, the most innovative entrepreneurs, the most enduring values: Freedom and equality, justice and opportunity. We should be so proud that those words are associated with us. Crowd: HILLARY! HILLARY! HILLARY! HILLARY! HILLARY! Hillary: And remember, remember, our founders fought a revolution and wrote a constitution. So America would never be a nation where one person had all the power. 240 years later, we still put our faith in each other. Look at what happened in Dallas after the assassinations of five brave police officers. Police Chief David Brown asked the community to support his force, maybe even join them. And you know how the community responded? Nearly 500 people applied in just 12 days. Hillary: And a lot of people looked at the title and asked “What the heck do you mean by that?” This is what I mean. None of us can raise a family, build a business, heal a community or lift a country totally alone. Hillary: America needs every one of us to lend our energy, our talents, our ambition to making our nation better and stronger. I believe that with all my heart. That’s why stronger together is not just a lesson from our history. It’s not just a slogan for our campaign. It’s a guiding principle for the country we’ve always been and the future we’re going to build. A country where the economy works for everyone not just those at the top. Hillary: Where you can get a good job and send your kids to a good school, no matter what zip code you live in. A country where all our children can dream and those dreams are within reach. Where families are strong, communities are safe and, yes, where love trumps hate. Crowd: Love trumps hate! Love trumps hate! Love trumps hate! Hillary: That’s the country we’re fighting for, that’s the future we’re working toward. And so my friends it is with humility, determination and boundless confidence in America’s promise that I accept your nomination for President of the United States. Hillary: Now. Sometimes the people at this podium are new to the national stage. As you know, I’m not one of those people. I’ve been your first lady, served eight years as a senator from the great state of New York. Hillary: Then I represented all of you as secretary of state. Hillary: But my job titles only tell you, what I’ve done. They don’t tell you, why. The truth is, through all these years of public service, the service part has always come easier to me than the public part. I get it. That some people just don’t know what to make of me. So let me tell you, the family I’m from, well, no one had their name on big buildings. My family were builders of a different kind. Builders in the way most American families are. They used whatever tools they had, whatever God gave them, and whatever life in America provided and built better lives and better futures for their kids. My grandfather worked in the same Scranton Lace mill for 50 years. Because he believed that if he gave everything he had, his children would have a better life than he did. And he was right. My dad, who made it to college, he played football at Penn State and enlisted in the Navy after Pearl Harbor. Hillary: So I went to work for The Children’s Defense Fund, going door-to-door in New Bedford, Massachusetts. Hillary: On behalf of children with disabilities who were denied the chance to go to school. I remember meeting a young girl in a wheelchair, on the small back porch of her house. She told me how badly she wanted to go to school. It just didn’t seem possible in those days. And I couldn’t stop thinking of my mother and what she’d gone through as a child. It became clear to me that simply caring is not enough. To drive real progress you have to change both hearts and laws. You need both understanding and action. So we gathered facts. We built a coalition. And our work helped to convince Congress to ensure access to education for all students with disabilities. It’s a big idea, isn’t it? Every kid with a disability has the right to go to school. Hillary: But how? How do you make an idea like that real? You do it step-by-step, year-by-year, sometimes even door-by-door. My heart just swelled when I saw Anastasia Somoza representing millions of young people on this stage. Hillary: Because we changed our law to make sure she got an education. So it’s true. I sweat the details of policy, whether we’re talking about the exact level of lead in the drinking water in Flint, Michigan, the number of mental health facilities in Iowa, or the cost of your prescription drugs. Because it’s not just a detail if it’s your kid, if it’s your family. It’s a big deal and it should be a big deal to your President too. Hillary: After the four days of this convention you’ve seen some of the people who have inspired me, people who let me into their lives and became a part of mine. People like Ryan Moore and Lauren Manning. They told their stories Tuesday night. I first met Ryan as a 7-year-old. He was wearing a full-body brace that must have weighed 40 pounds, because I leaned over to lift him up. Children like Ryan kept me going when our plan for universal health care failed. And kept me working with leaders of both parties, to help create the Children’s Health Insurance program, that covers eight million kids in our country. Hillary: Lauren Manning who stood here with such grace and power was gravely injured on 9/11. It was the thought of her and Debbie St. John, who you saw in the movie, and John Dolan, and Joe Sweeney, and all the victims and survivors that kept me working as hard as I could in the Senate, on behalf of 9/11 families, and our first responders who got sick from their time at Ground Zero. I was thinking of Lauren, Debbie, and all the others 10 years later in the White House Situation Room, when President Obama made the courageous decision that finally brought Osama Bin Laden to justice. Hillary: And in this campaign I’ve met many more people who motivate me to keep fighting for change. And with your help I will carry all of your voices and stories with me to the White House. Hillary: And you heard from Republicans and Independents who are supporting our campaign. Well, I will be a President for Democrats, Republicans, Independents, for the struggling, the striving, the successful, for all those who vote for me and for those who don’t. For all Americans together. Hillary: Tonight we’ve reached a milestone in our nations march toward a more perfect union, the first time that a major party has nominated a woman for President. Hillary: Standing here… Standing here as my mother’s daughter and my daughter’s mother. I’m so happy this day has come, I’m happy for grandmothers and little girls, and everyone in between. I’m happy for boys and men because when any barrier falls in America it clears the way for every one. Hillary: After-all when there are no ceilings the sky’s the limit. Hillary: So let’s keep going. Let’s keep going until every one of the 161 million women and girls across America has the opportunity she deserves to have. Hillary: But even more important than the history we make tonight, is the history we will write together in the years ahead. Let’s began with, what we’re going to do to help working people in our country get ahead and stay ahead. Now, I don’t think President Obama and Vice President Biden get the credit they deserve for saving us from, the worst economic crisis of our lifetimes. Hillary: Our economy is so much stronger than when they took office, nearly 15 million new private sector jobs. Twenty million more Americans with health insurance and an auto industry that just had its best year ever. Hillary: Now, that’s real progress, but none of us can be satisfied with the status quo. Not by a long shot. We’re still facing deep seated problems that develop long before the recession, and stayed with us through the recovery. I’ve gone around the country talking to working families, and I’ve heard from many who feel like the economy sure isn’t working for them. Some of you are frustrated, even furious. And you know what? You’re right. It’s not yet working the way it should. Americans are willing to work and work hard. But right now an awful lot of people feel there is less and less respect for the work they do. And less respect for them, period. Democrats, we are the party of working people. Hillary: But we haven’t done a good enough job showing we get what you’re going through. And we’re going to do something to help. So tonight I wanna tell you, how we will empower Americans to live better lives. My primary mission as President will be to create more opportunity and more good jobs with rising wages, right here in the United States. Hillary: From my first day in office to my last. Especially in places that for too long have been left out and left behind. From our inner cities to our small towns. From Indian country to coal country. From communities ravaged by addiction to regions hollowed out by plant closures. And here’s what I believe. I believe America thrives when the middle class thrives. I believe our economy isn’t working the way it should because our democracy isn’t working the way it should. Hillary: That’s why we need to appoint Supreme Court justices, who will get money out of politics and expand voting rights, not restrict them. And if necessary we will pass a constitutional amendment to overturn Citizens United. I believe American corporations that have gotten so much from our country should be just as patriotic in return. Many of them are, but too many aren’t. It’s wrong to take tax breaks with one hand and give out pink slips with the other. Hillary: And I believe Wall Street can never ever be allowed to wreck Main Street again. And I believe in Science. Hillary: I believe climate change is real. And that we could save our planet while creating millions of good paying clean energy jobs. Hillary: I believe that when we have millions of hardworking immigrants contributing to our economy, it would be self defeating and inhumane to try to kick them out. Hillary: Comprehensive immigration reform will grow our economy and keep families together. And it’s the right thing to do. Whatever party you belong to or if you belong to no party at all, if you share these beliefs this is your campaign. Hillary: If you believe that companies should share profits, not had executive bonuses. Join us. Hillary: If you believe, the minimum wage should be a living wage. And no one working full-time should have to raise their children in poverty. Join us. Hillary: If you believe that every man, woman and child in America has the right to affordable health care. Join us. Hillary: If you believe that we should say no to unfair trade deals, that we should stand up to China, that we should support our steel workers, and auto workers, and homegrown manufacturer. Then, join us. Hillary: If you believe we should expand Social Security and protect the woman’s right to make our own health care decision. Then join us. Hillary: And yes, if you believe that your working mother, wife, sister or daughter deserves equal pay. Join us. Hillary: That’s how we’re going to make sure this economy works for everyone, not just those at the top. Now you didn’t hear any of this, did you? From Donald Trump at his convention. He spoke for 70 odd minutes, and I do mean odd. Hillary: And he offered zero solutions, but we already know he doesn’t believe these things. No wonder he doesn’t like talking about his plans. You might have noticed, I love talking about mine. In my first 100 days, we will work with both parties to pass the biggest investment in new good paying jobs since World War II. Jobs in manufacturing, clean energy, technology and innovation. Small business and infrastructure. If we invest in infrastructure now, we’ll not only create jobs today, but lay the foundation for the jobs of the future. And we will also transform the way we prepare our young people for those jobs. Bernie Sanders and I will work together to make college tuition free for the middle class and debt free for all. Hillary: We will also… We will also liberate millions of people who already have student debt. It’s just not right that Donald Trump can ignore his debts, and students and families can’t refinance their debts. Hillary: And something we don’t say often enough, sure college is crucial, but a four year degree should not be the only path to a good job. Crowd: Deal me in! Deal me in! Deal me in! Hillary: Now, we’re not only going to make all of these investments. We’re going to pay for every single one of them, and here’s how, Wall Street, corporations and the super rich are going to start paying their fair share of taxes. Hillary: This is not because we resent success. But when more than 90% of the gains have gone to the top 1%, that’s where the money is. And we are going to follow the money. Hillary: Well, look at my record. I’ve worked across the aisle to pass laws and treaties, and to launch new programs that help millions of people. And if you give me the chance that’s exactly what I’ll do as President. But then I also imagine people are thinking out there, “But Trump. He’s a businessman. He must know something about the economy.” Well, let’s take a closer look, shall we? In Atlantic City, 60 miles from here, you will find contractors and small businesses who lost everything because Donald Trump refused to pay his bills. Hillary: Now remember what the President said last night, “Don’t boo. Vote.” But think of this, people who did the work and needed the money, not because he couldn’t pay them but because he wouldn’t pay them. He just stiffed them. And you know that sales pitch he’s making to be President. Put your faith in him and you’ll win big. That’s the same sales pitch he made to all those small businesses. Then Trump walked away and left working people holding the bag. He also talks a big game about putting America first. Well, please explain, what part of America first leads him to make Trump ties in China, not Colorado. Trump socks in Mexico, not Michigan. Trump furniture in Turkey, not Ohio. Trump picture frames in India, not Wisconsin. Donald Trump says he wants to make America great again. Well, he could start by actually making things in America again. Hillary: Now, the choice we face in this election is just as stark when it comes to our national security. Hillary: You know anyone… Anyone reading the news can see the threats and turbulence we face from Baghdad to Kabul, to Nice and Paris, and Brussels. From San Bernardino to Orlando we’re dealing with determined enemies that must be defeated. So it’s no wonder that people are anxious and looking for reassurance, looking for steady leadership. Wanting a leader who understands, we are stronger when we work with our allies around the world and care for our veterans here at home. Keeping our nation safe and honoring the people who do that work, will be my highest priority. I’m proud that we put a lid on Iran’s nuclear program without firing a single shot. S0: Now, we have to enforce it. And we must keep supporting Israel’s security. Hillary: Well, I’ve had the privilege to work closely with out troops and our veterans for many years including as a Senator on the armed services committee and I know how wrong he is. Our military is a national treasure. We entrust our Commander-in-Chief. A President should respect the men and women who risk their lives to serve our country. Hillary: Including Captain Khan and the sons of Tim Kaine and Mike Pence, both Marines. Hillary: So just ask yourself. You really think Donald Trump has the temperament to be Commander-in-Chief? Hillary: Donald Trump can’t even handle the rough and tumble of a presidential campaign. Hillary: He loses his cool at the slightest provocation. What he’s gotten a tough question from a reporter, when he’s challenged in a debate, when he sees a protester at a rally. Imagine, if you dare imagine, imagine him in the oval office facing a real crisis. A man you can bait with a tweet is not a man we can trust with nuclear weapons. Hillary: I can’t put it, I can’t put it any better than Jackie Kennedy did after the Cuban Missile Crisis. She said that what worried President Kennedy during that very dangerous time was, that a war might be started; not by big man with self-control and restraint, but by little man that once moved by fear and pride. Hillary: America’s strength doesn’t come from lashing out, it relies on smarts, judgment, cool resolve, and the precise and strategic application of power, and that’s the kind of Commander-in-Chief I pledge to be. Hillary: And if we’re serious about keeping our country safe, we also can’t afford to have a President who’s in the pocket of the gun lobby. Hillary: I’m not here to repeal the Second Amendment, I’m not here to take away your guns. I just don’t want you to be shot by someone who shouldn’t have a gun in the first place. Hillary: We will work tirelessly with responsible gun owners to pass common sense, reforms, and keep guns out of the hands of criminals, terrorists, and all others who would do us harm. You know for decades people have said this issue was too hard to solve at the politics, too hot to touch. But I ask you, how can we just stand by and do nothing? You heard, you saw family members of people killed by gun violence on this stage. You heard, you saw family members of police officers killed in the line of duty because they were outgunned by criminals. I refuse to believe we can’t find common ground here. We have to heal the divides in our country, not just on guns but on race, immigration and more. Hillary: And that starts with listening, listening to each other trying as best we can. To walk in each other’s shoes. So let’s put ourselves in the shoes of young black and Latino men and women who face the effects of systemic racism and are made to feel like their lives are disposable. Hillary: Let’s put ourselves in the shoes of police officers kissing their kids and spouses goodbye every day, heading off to do a dangerous and necessary job. We will reform our criminal justice system from end to end, and rebuild trust between law enforcement and the communities they serve. And we will defend, we will defend all our rights, civil rights, human rights and voting rights, women’s rights and workers rights, LGBT rights and the rights of people with disabilities. Hillary: And we will stand up against mean and divisive rhetoric wherever it comes from. You know, for the past year many people made the mistake of laughing off Donald Trump’s comments, excusing him as an entertainer just putting on a show. They thought he couldn’t possibly mean all the horrible things he says. Like when he called women pigs, or said that an American judge couldn’t be fair because of his Mexican heritage, or when he mocks and mimics a reporter with a disability, or insults prisoners of war like John McCain, a hero and a patriot who deserves our respect. Now at first I admit, I couldn’t believe he meant it either, it was just too hard to fathom that someone who wants to lead our nation could say those things. Could be like that. But here’s the sad truth, there is no other Donald Trump. This is it. And in the end it comes down to what Donald Trump doesn’t get. America is great because America is good. Hillary: So, enough with the bigotry and the bombast. Donald Trump’s not offering real change, he’s offering empty promises. And what are we offering? A bold agenda to improve the lives of people across our country to keep you safe, to get you good jobs, to give your kids the opportunities they deserve. The choice is clear my friends. Every generation of Americans has come together to make our country freer, fairer and stronger. None of us ever have, or can do it alone. I know that at a time when so much seems to be pulling us apart, it can be hard to imagine how we’ll ever pull together. But I’m here to tell you tonight progress is possible. I know, I know because I’ve seen it in the lives of people across America who get knocked down and get right back up. And I know it, I know it from my own life, more than a few times I’ve had to pick myself up and get back in the game. Hillary: Like so much else in my life. I got this from my mother too, she never let me back down from any challenge. When I tried to hide from a neighborhood bully, she literally blocked the door, “Go back out there” she said. And she was right, you have to stand up to bullies, you have to keep working to make things better. Even when the odds are long and the opposition is fierce. We lost our mother a few years ago, but I miss her everyday, and I still hear her voice urging me to keep working, keep fighting for right no matter what. That’s what we need to do together as a nation. Hillary: And though we may not live to see the glory as the song from the musical Hamilton goes, “Let us gladly join the fight. Let our legacy be about planting seeds in a garden you never get to see.” That’s why we’re here, not just in this hall but on this earth. The founders showed us that, and so have many others since, they were drawn together by love of country and the selfless passion to build something better for all who follow. That is the story of America and we began a new chapter tonight. Yes, the world is watching what we do. Yes, America’s destiny is ours to choose. So let’s be stronger together my fellow Americans. Let’s look to the future with courage and confidence. Let’s build a better tomorrow for our beloved children and our beloved country. And when we do, America will be greater than ever. Thank you. And may God bless you and the United States of America.